Italy is part of the Schengen area. You can check the steps required to get a visa on the website of our Ministry of Foreign Affairs. The Fiumicino - Leonardo Da Vinci International Airport (FCO) is the main airport in Rome. FCO has four terminals (T1, T2, T3, and T5) and is connected to the city center through a train station, cabs, and a number of shuttle services. Terminals T1, T2, and T3 are within walking distance from each other and from the train station. T5 is connected to T3 by a shuttle bus. There is no T4 yet. The Leonardo Express train service connects the Fiumicino airport to the center of Rome, with trains departing about every 30 minutes and arriving at Roma Termini, which is the main hub for trains, buses and subway lines. 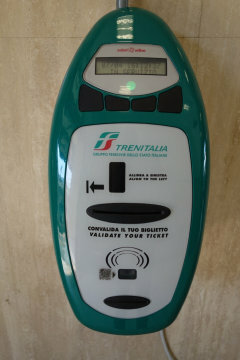 The duration of the journey is approximately 30 minutes and the cost of a regular ticket is 14 euro per person. Tickets can be purchased at vending machines (both cash and credit cards are accepted, see picture on the left), ticket offices, or on-line. Remember to stamp your ticket at a validating machine (such as the one on the right) before getting on the train. There is a validating machine at every platform. If you forget to validate your ticket, you might get a hefty fine! E-tickets purchased online do not need to be validated. 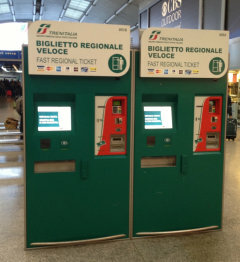 If you are not staying close to Termini, there is another (slower) train called FL1 Regional Train that connects Fiumicino to the other main train stations in Rome (Trastevere, Ostiense, Tuscolana and Tiburtina). The cost of a regular ticket is 8 euro; tickets can be bought and validated as for the Leonardo Express train. FL1 trains departing from Fiumicino have final destination Orte or Fara Sabina. Taxis licensed by the Municipality of Rome are white. Get in the taxi queue right outside your terminal and ask the driver if a fixed fare is available for your destination. There is a flat rate of 48 euro for rides between Fiumicino airport and locations within the Aurelian Walls (the Mura Aureliane enclose the historical city, thus including hotels close to the ECOOP venue - check this map to be sure). Fixed fares are available also for Tiburtina (55 euro) and Ostiense (45 euro) stations. The duration of the journey from the airport to the city center is typically 40-50 minutes. If you are traveling on a budget, there are a number of cheap shuttle options such as TerraVision and TAM Bus that you can check out. The Ciampino - G.B. Pastine International Airport is the secondary airport of Rome and serves flights for Ryanair and Wizz Air. The airport has only one terminal and is connected to the city center through cabs, bus services, and a railway (though in this case you should reach the city of Ciampino first). Cabs are located near the airport exit and, as for Fiumicino, fixed fares are available too. For destinations within the Aurelian Walls the fee is 30 euro. A number of bus shuttle services to reach Termini Station are available as well. Unless you’re traveling on a budget, we recommend flying to Fiumicino, which is better connected to the city center than Ciampino. Please refer to the venue page for further information. AC Power Plugs and Sockets. In Italy the standard voltage is 230 V. The standard frequency is 50 Hz. 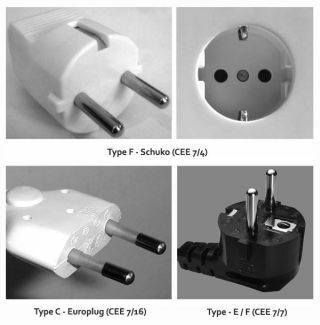 The power sockets that are used are of German type F and (most commonly) Italian type L, both compatible with C Europlugs (with two round pins). 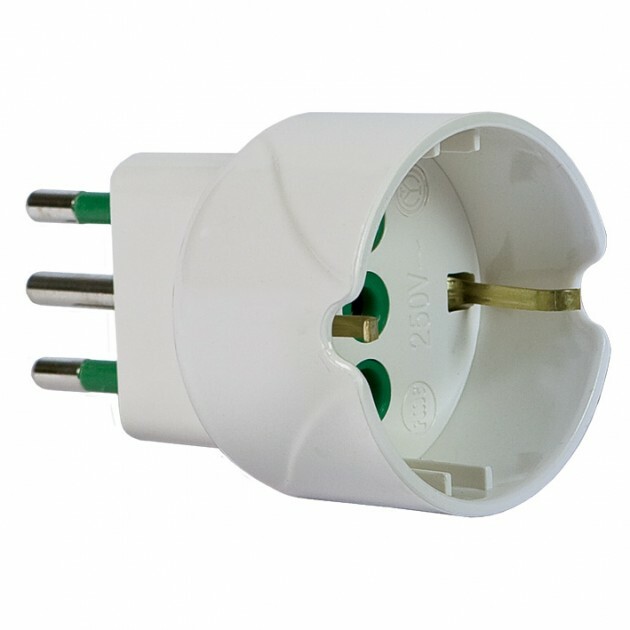 Adapters from German type F plugs to Italian type L sockets are widely available (e.g., at supermarkets).